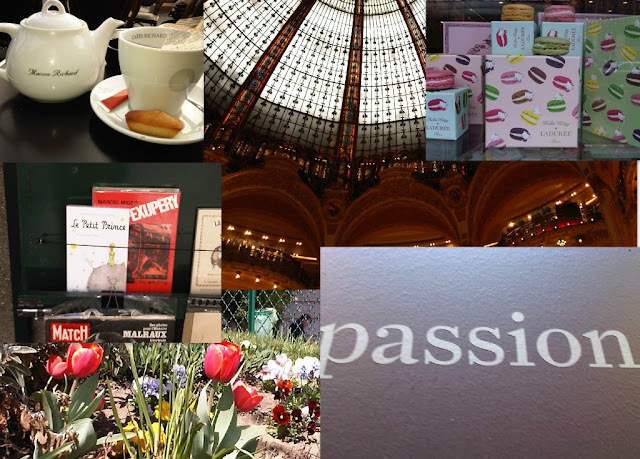 A great cup of tea in front of the Eiffel Tower, one of my favorite books Le Petit Prince, red tulips, the wonderful ceiling of the Lafayette Galeries, macarons from Ladurée and the word that sums up all the previous images: PASSION. Uma ótima chávena de chá em frente à Torre Eiffel, um dos meus livros preferidos O Pequeno Principe, tulipas vermelhas, o maravilhoso teto das Galerias Lafayette. macarons da Ladurée e a palavra que consegue sumarizar todas as restantes imagens: PAIXÃO.